Recent talk of Orlando moving to MLS has led one minority owner of that club to look into expanding USL to Louisville, KY.
$250k check made out to Tim Holt and the team is his. Just call Ditech for details, no income verification required! We talked about this briefly in another thread. There was an article the other week that when Orlando goes to MLS they'll still have a USL franchise to do something with. They were kicking around the idea of moving it to another city and affiliating with that club. The interesting part is the minority owner (besides saying he wants to have a USL club in Louisville) also owns a development group that just started construction on a 16 million dollar, 5,800 soccer stadium for the University of Louisville. I don't know how much sway this minority owner has, but everything would sure line up to have Orlando move their USL franchise to Louisville in 2015/2016. Unless they changed the league bylaws, Orlando has to actually be using their franchise or they would lose it. Your either an active franchise and playing in the season or the franchise reverts back to the league. Althought there has been a couple waivers given. So they might let them hang on to it for a year before taking it back. Unless I'm missing something (certainly possible), Orlando will be playing 2014 in USL PRO, and will not commence play in MLS until 2015. If so, there's plenty of time to figure out what, if anything, to do relative to Orlando's USL PRO franchise (e.g., relocate or terminate), no? I agree that they have more then enough time to figure out what they will do with their franchise. But doubt if they will have much additional time during the year they prep for MLS, to also plan on setting up a ULS Pro franchise in another city. So if they are going to do that, they will need a completely seperate group to do that. But for the most part I was pointing out that you can't really have a not active franchise. That was my real goal of the post. My guess is that Orlando City has been a very positive PR scenario for USL. If they can keep even part of their ownership involved still by moving the USL Pro franchise and allow them to be the new MLS affiliate of the soon-to-be Orlando City MLS club, then USL will do it. Would set up a nice midwest regional rivalry between Dayton Ohio, St. Louis and Oklahoma City. 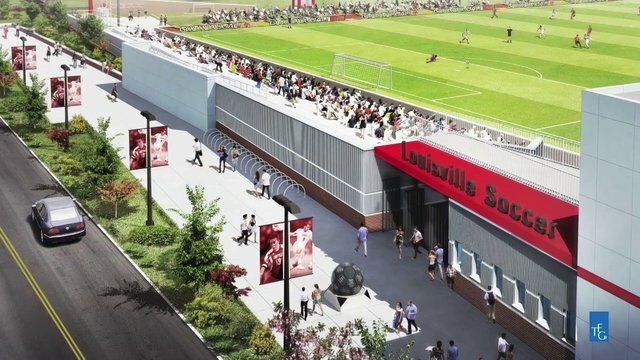 University of Louisville's new soccer stadium, brought to you by Wayne Estopinal, part-owner of the Orlando City SC. THAT is a pretty nice stadium for NCAA soccer. So, to make sure I understand. Orlando plays in USL until the MLS team starts. Then once Orlando MLS is up and running, Louisville could become their USL-3 affiliate ? The difference, of course, being that Dayton and Oklahoma City actually have teams. Home of the Louisville Loopholes! blacksun and Skippysasquirrel repped this. I did get a tweet from Wayne Estopinal. Sounds like he is working on it, doesn't it? @pkickorlando @straitpinkie I would spend less time convincing ppl of MLS & more time helping @WayneEstopinal and promoting USL Pro. msilverstein47 and kenntomasch repped this. Kentucky is all about [college] basketball. It's hard to make anything else go. Isn't that argument a little old nowadays? Nope. Not when you have been in the area for an extended period -- maybe you have? Now, maybe it's possible to get something going in the "offseason," i.e. summer. But, I'm not going to hold my breath on it. I really don't know how well the River City Rovers attendance has been. In the northern Kentucky region, the Cincinnati Kings didn't get any attendance at their USL Pro matches when they were. Now, I think Louisville Lightning games were/are somewhat attended decently. If you told me that Orlando or Utah could have 20,000+ in attendance for soccer 10 years, I would be hard pressed to believe it. But its reality now. I really think the old "hard lines" aren't so solid any more and this perhaps is a new age we live in. Well the Louisville men's soccer team averaged 1,452 last year. I'm guessing they didn't do a lot of marketing to get that figure. That's a better figure then a few of the current USL Pro teams. And the Louisville men's basketball team gets 20,000-22,000+ at its home games. What's your point there? The majority of the USL Pro season runs when there are no students on campus, so they won't help that attendance figure. They also get over 50,000 fans (on average) for their football games. There's also over 22,000 students at the University of Louisville. That's also more than what USL Pro teams get. I bet they did decent marketing to get that figure. Orlando hasn't had 20,000 in attendance (only for a championship game). They averaged 8,000+ for the 2013 season with the largest attendance figure being 10,000-ish.